A Caffè Ritazza restaurant unit. 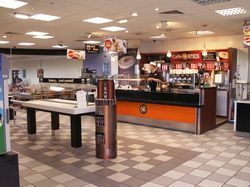 In the 2000s, service stations began to move their focus towards selling coffee and snacks. For Moto, they used Compass own-brand Caffè Ritazza. Moto's main restaurant, Fresh Express, had stands inspired by several of their partner brands. At most services, this meant there was a counter serving Ritazza's coffee and drinks within the main restaurant. Some services also had large Caffè Ritazza lounges, with what we would now consider to be contemporary coffee shop seating. It was placed by the entrance as a takeaway offer where space allowed. Moto also introduced it to their facilities in Dover Port and in France's Aire de Vernay. Before its success as a Moto brand, in 2001 Caffè Ritazza was recruited as one of the Little Chef Choices. This saw Caffè Ritazza and sister brands such as Harry Ramsden's and Upper Crust introduced to about 30 Little Chef restaurants. These closed in 2003. Moto registered the name Baristo Coffee Rush in 2005. It's not clear if this was ever used. In 2008 Moto phased out Fresh Express. 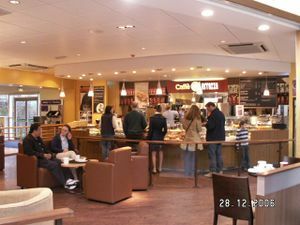 At the same time, they introduced Costa to their services, which either replaced Caffè Ritazza or, where space was available, worked alongside it. All the remaining Ritazza outlets were eventually removed in 2009. Caffè Ritazza don't operate at any services in the UK any more, but can still be found at airports and railway stations.